“Southern Comfort” is a well-made film, but it suffers from a certain predictability. I suspect the predictability is part of the movie's point. The film is set in the Cajun country of Louisiana, in 1973, and it follows the fortunes of a National Guard unit that gets lost in the bayous and stumbles into a metaphor for America's involvement in Vietnam. The movie's approach is direct, and its symbolism is all right there on the surface. From the moment we discover that the guardsmen are firing blanks in their rifles, we somehow know that the movie's going to be about their impotence in a land where they do not belong. And as the weekend soldiers are relentlessly hunted down and massacred by the local Cajuns (who are intimately familiar with the bayou), we think of the uselessness of American technology against the Viet Cong. The guardsmen are clearly strangers in a strange land, and they make fatal blunders right at the outset. They cut the nets of a Cajun fisherman, they "borrow" three Cajun boats, and they mock the Cajuns by firing blank machine-gun rounds at them. The Cajuns are not amused. By the film's end, guardsmen will have been shot dead, impaled, hung, drowned in quicksand, and attacked by savage dogs. And all the time they try to protect themselves with a parody of military discipline, while they splash in circles and rescue helicopters roar uselessly overhead. 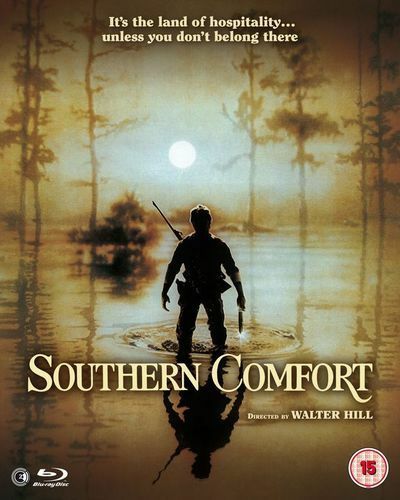 All this action is shown with great effect in “Southern Comfort.” The movie portrays the bayous as a world of dangerous beauty. Greens and yellows and browns shimmer in the sunlight, and rare birds call to one another, and the Cajuns slip noiselessly behind trees while the guardsmen wander about making fools and targets of themselves. “Southern Comfort” is a film of drum-tight professionalism. Who are these men? Of the Cajuns we learn nothing: They are invisible assassins. Of the guardsmen, however, we learn little more. One is swollen with authority. One intends to look out for himself. One is weak, one is strong, and only the man played by Keith Carradine seems somewhat balanced and sane. Once we get the psychological labels straight, there are no further surprises. And once we understand the structure of the movie (guardsmen slog through bayous, get picked off one by one), the only remaining question is whether any of them will finally survive. That's the weakness of the storytelling. The strength of the movie is in its look, in its superb use of its locations, and in Hill's mastery of action sequences that could have been repetitive. The action is also good: The actors are given little scope to play with in their characters, but they do succeed in creating plausible weekend soldiers. "We are the Guard!" they chant, and we believe them. And there is one moment of inspired irony, when they are lost, cold, wet, hungry, and in mortal fear of their lives, and one guy asks, "Why don't we call in the National Guard?"